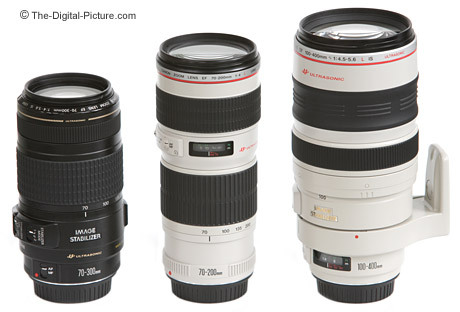 Note: The Canon EF 70-300mm f/4-5.6 IS USM Lens has been replaced by the Canon EF 70-300mm f/4-5.6 IS II USM Lens. With the introduction of the Canon EF 70-300mm f/4-5.6 IS USM Lens, Canon has replaced one of its most popular lenses and its first image stabilized lens - the Canon EF 75-300mm f/4-5.6 IS. The 75-300mm IS lens was popular because of its useful focal length range, small size, light weight, midrange price and Image Stabilization. The 70-300 IS improves this overall package (sacrificing only price somewhat). Using the 1/(focal length) rule, this lens can be handheld at 300mm with a shutter speed of 1/45 of a second (of course, your mileage may vary). I am getting sharp handheld images consistently at 1/4 or 1/5 second shutter speeds at 70mm and at 1/25 second at 300mm on a full frame body. All of the 70-300 IS sample pictures (link below) were taken handheld. Automatic tripod sensing prevents "... feedback loops between the IS sensor and stabilizer motor vibrations" [Canon]. This implementation of IS includes Mode 1 and 2 stabilization. Use mode 1 (dual axis stabilization) when shooting stationary subjects and mode 2 (single axis stabilization) when panning with a moving subject. The IS switches are recessed to prevent accidental changes - a nice improvement. In my opinion, image stabilization is the best feature of this lens. It is a significant help when shooting stationary subjects without a tripod. Image stabilization is especially helpful to a slow (narrow aperture) lens. Slow is relative of course - the Canon EF 70-300mm f/4-5.6 IS USM Lens apertures are typical for a consumer telephoto zoom lens. The chart below shows the focal length that triggers a maximum aperture decrease to that listed in the column heading above for each lens. An 8-blade circular aperture gives the 70-300 IS a good defocused image quality (often referred to as bokeh). 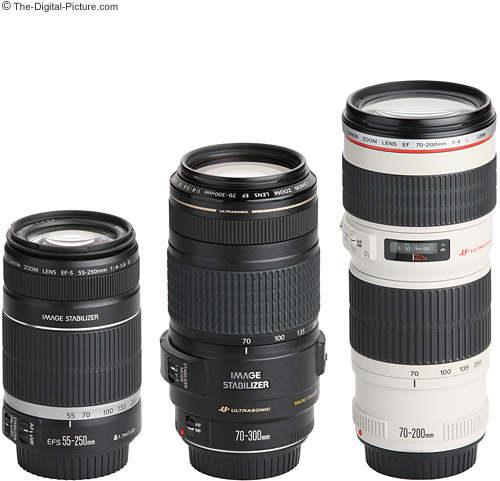 Shown above from left to right are the Canon EF-S 55-250mm f/4-5.6 IS Lens, Canon EF 70-300mm f/4-5.6 IS USM Lens and Canon EF 70-200mm f/4L USM Lens. Use the mouse-over text links under the image to see the lenses in their extended positions. The two black-colored lenses extend both during focusing and with focal length increases. I find the non-extending lenses nicer to use but the retracting lenses are often easier to carry when not in use. The same three lenses are shown again above - this time with their hoods in place. Again, the mouseover links will show you the min and max sizes. Lens hoods are optional with most of Canon's non-L lenses and this remains the case with the 70-300 IS. You should consider adding a Canon ET-65B Lens Hood to your shopping cart along with the 70-300 IS if you determine that this is the right lens for you. 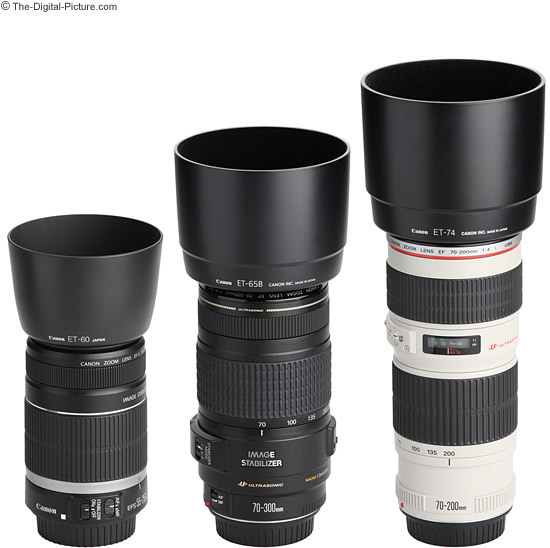 Essentially the same weight and size as the Canon EF 75-300mm f/4.5-5.6 IS USM Lens, the Canon EF 70-300mm f/4-5.6 IS USM Lens is moderately small, light and more inconspicuous than a white lens. Though the inner lens barrel has some play/wobble in it, build quality is decent overall. The lens feels solid. A useful zoom-lock switch is provided to prevent the lens from gravity extending - and it will do this when unlocked. The small 58mm filter size means that quality filters will not be expensive. Slow focusing was one of the downfalls of the Canon EF 75-300mm f/4.5-5.6 IS USM Lens. 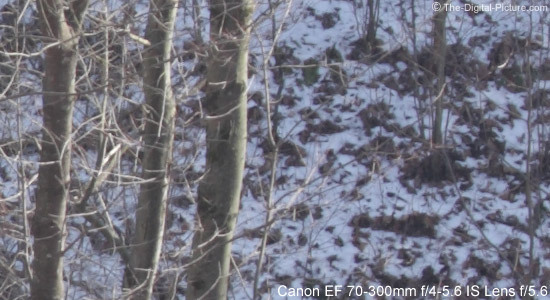 Canon states that autofocus has been improved in the 70-300 IS. But, Ring USM (Ultrasonic Motor) is not part of the package. Improvements in the CPU and AF routines help in the focus performance increase according to Canon. Accuracy is often more important than speed. Good thing as actual performance of the Micro USM AF shows accuracy to be very good but speed is just OK - not as good as I had hoped. AF motor noise is not bad. FTM (Full Time Manual) focus is not provided - you must switch the lens to MF (Manual Focus) mode to manually focus the lens. To make matters worse, the 70-300 extends about 1" with focusing. To park the lens compactly, you often must adjust the focus to minimize the lens length. This means manually turning AF off, turning the focus ring to retract the lens and turning AF back on (so you don't forget next time you use the lens). Of course, if you don't care about minimizing the lens length, this attribute will not affect your enjoyment of this lens. The 70-300 IS is not parfocal - you need to refocus if you change the focal length. Combine a non-parfocal zoom lens with a rotating front element and you quickly get frustrated Circular Polarizer Filter users. This is a definite detraction for landscape photography - an otherwise great use for this lens. Canon's manual suggests that the front element should be held while attaching a 58mm filter or lens hood (to prevent it from rotating). The glass in the 70-300 IS (including one UD element) is new and designed with digital SLRs in mind. Ghosting and flare caused by reflective imaging sensors are not problems. Although I can't say I have much problem with ghosting in most of my good lenses, flat lens elements can act as mirrors reflecting light back to the sensor causing a ghosting of the primary image. Canon's MTF charts indicate a performance improvement over the 75-300 IS - especially sharpness at 300mm (where the 75-300 IS was weakest). My experience is proving this out. The Canon EF 70-300mm f/4-5.6 IS USM Lens has good center sharpness wide open at the wide end. Center sharpness decreases slightly as the focal length is increased to its weakest at 300mm. The lens becomes soft beyond 200mm. Stopping down improves sharpness somewhat but it is still weakest at 300mm. Corners are soft at the ends of the focal length range and sharpen up noticeably as the aperture is stopped down. The long end of the focal length range continues to be the weakest performing over the range - especially in the vertical orientation. I don't make it a habit to formally test lenses in both vertical and horizontal orientations, but after hearing some reports of an anomaly I did some testing. Shots taken at the longer focal lengths are indeed sharper in horizontal orientation than in vertical orientation. I'll let Canon explain that one. Update: Canon has addressed the vertical sharpness issue through a service notice. Canon has performed this work (no charge) on my lens and I am pleased with the results. Overall, sharpness is definitely improved from the 75-300 IS. The 70-300 IS exhibits barrel distortion (on a full frame body from 70mm to 120mm or so. Slight pincushion distortion is visible at 300mm. Flare and CA are well controlled. Vignetting is noticeable in the corners (especially at 300mm) on a full frame body only. As seen above, the Canon EF 70-300mm f/4-5.6 IS USM Lens has a short MFD (Minimum Focus distance) and delivers a MM (Maximum Magnification) similar to that of the Canon EF 300mm f/4L IS USM Lens. Although it is not compatible with Canon's extenders, extension tubes will extend the 70-300's macro capabilities as can also be seen in the chart above. The Canon Close-up Lenses offer another method of reducing the MFD/MM. 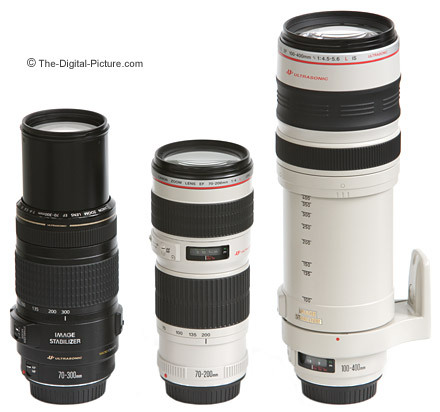 Pictured above are the Canon EF 70-300mm f/4-5.6 IS USM Lens, Canon EF 70-200mm f/4L USM Lens and Canon EF 100-400mm f/4.5-5.6L IS USM Lens. The same three lenses are shown below in their extended positions. The above comparison shows the sharpness and contrast difference of three lenses at 70mm. This is a 100% crop taken from approximately 1/3 of the way into the right side of the frame of a 1.6x FOVCF 40D. For comparison purposes, the flat/low contrast "Neutral" Picture Style was used for processing these RAW pics. Sharpening set to "1" (very low) was the only adjustment made. All lenses were set to the marked 70mm focal length, though they are not quite identical in their field of view/magnification at this setting. All three lenses are shown stopped down 1 stop to f/5.6 while the 70-200 is also shown at f/4. Use the mouseover links to see the difference between these lenses. Obviously, the Canon EF 70-200mm f/4L USM Lens is the best performer in this comparison. Actually, it is the best in most of them. The 70-200 delivers images that are at least as sharp or sharper with at least as high or higher contrast at most comparable focal lengths, aperture settings and positions in the frame. The 70-200 has a fixed wide aperture that becomes faster than the 70-300 at 85mm and is a full stop faster at 200mm. The 70-200 has a professional grade build quality and fast, quiet Ring USM AF. The 70-300's one big advantage is the 100mm longer focal length range, but this enters the 70-300's weakest range optically. The 70-200 is compatible with the Canon extenders - and becomes a 98-280mm f/5.6 lens with the 1.4x. But this of course adds to the cost of the lens. The 70-300's other big advantage is image stabilization. 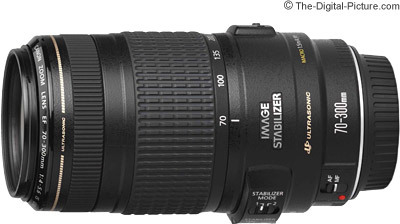 The 70-200 f/4 is available in an IS model, but this is a more expensive lens. The difference between the Canon EF 70-300mm f/4-5.6 IS USM Lens and the Canon EF-S 55-250mm f/4-5.6 IS Lens (1.6x FOVCF mount only) is the reverse for the most part. The 55-250 has less play in the barrel than the 70-300, but the 70-300 is more solidly built including a metal lens mount. The 70-300 is larger and heavier. The 55-250 has a more-matte finish. While the focus ring on both lenses turns during AF, the 70-300's focus ring does not manually turn in AF mode. This makes lens hoods and filters easier to install/remove, but makes parking the lens in the most compact size more difficult (though you are not supposed to turn the focus ring on the 55-250 in AF mode either). While the 70-300 has USM AF, it is Micro USM - not Ring USM - and is not greatly different from the 55-250 in AF speed. The 70-300 is compatible with all EOS bodies including full frame film and digital models. To the 55-250's advantage is that it retracts to a smaller size, weighs less and costs less. In the image quality department, these two lenses are more similar than in the 70-200 L comparison. Wide open, both lenses are similar in sharpness at the center of the frame, but the 70-300 is generally sharper in the corners - which is not surprising as it is a full-frame compatible lens. Stopping down 1 stop makes a bigger difference in sharpness on the 70-300 than it does on the 55-250 - and this gives the 70-300 a bigger edge at these apertures. The 55-250 delivers better image sharpness at 250mm than the 70-300 does at 300mm. The 70-300 shows less vignetting wide open on a 1.6x body. The 70-300 has less distortion over most of its focal length range. The Canon EF 100-400mm f/4.5-5.6L IS USM Lens is a very good choice for better image quality in this general focal length range (lose 30mm on the wide end, gain 100mm on the long end). Although not as noticebly better for sharpness as the 70-200 f/4 is, the 100-400 is still a better lens (optically and mechanically) in my opinion. It is considerably larger, heavier and more expensive. The Canon EF 70-300mm f/4.5-5.6 DO IS Lens is in an interesting position in Canon's lineup - sharing the basic optical specs of the 70-300 IS. Although it is 1.5" shorter, the DO actually weighs 5.4 oz more and costs significantly more. The DO is better built and has Ring USM, but is not impressive to me optically. I prefer the Canon EF 70-300mm f/4-5.6 IS USM Lens over the 55-250, but my personal preference in this price range is for the Canon EF 70-200mm f/4L USM Lens over the 70-300. There are a lot of happy Canon EF 70-300mm f/4-5.6 IS USM Lens owners out there, so as always, you need to make the decision for yourself.